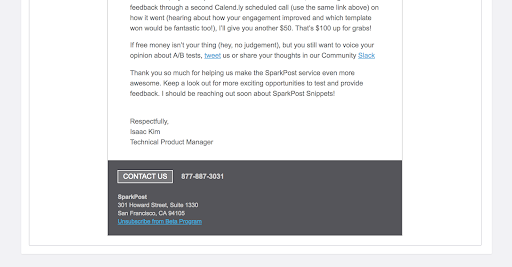 Earlier this year, I shared a preview of Snippets—a great new feature in SparkPost’s email templating capabilities. Snippets are modular, reusable content that, once created, can be imported into the HTML, Text, or AMP part of any email template using our render_snippet macro call. Snippets make maintaining consistent content really efficient. One classic scenario is to make sure every email you send uses a standard footer, social share buttons, and the like. And there certainly are many more. 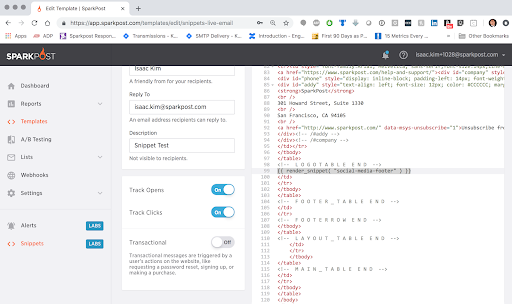 Experienced SparkPost users might notice that Snippets play a similar role to the dynamic_html and dynamic_plain functions of SparkPost templates, with a key difference: snippets are created and stored ahead of time, rather than passed inline within a transmissions request. Getting Started with Snippets in 3.. 2.. 1..
Here’s a quick walk-through of how to get started with Snippets. First things first: let’s create a new snippet. In this example, a snippet is being used to add social media buttons to a stored email template. The social media snippet can be called across many templates, so updating the snippet with a new button or content, will update all templates that call that snippet in the future! Once you’ve logged into SparkPost, click “Snippets” in the left navbar. On the Snippets page, you’ll see a list of existing snippets, if any. Otherwise, you’ll see a blank slate. Let’s change that! Let’s create a new snippet. Click on the button on the top right labeled “Create Snippet”. Give your snippet a name. You’ll note that we automatically suggest a new snippet ID for you as well, but you’re welcome to override that with any unique ID text you wish. We’ll leave the subaccount field alone for this tutorial. Add in your HTML content and Text content as desired. Click the “Create” button to save this new test and go to the next step. Click on “Templates” on the left navbar and pick any stored template you’d like to have a snippet added to. Above the content editor, you’ll find a new button called “Import Snippet”. Begin to type in the name of your snippet, and the list below will immediately show you snippets you’ve created that match the letters typed. Determine where in your template you’d like to add your snippet, and then simply paste the snippet code into your template. Step Three: Send the Email! How Will You Use Snippets? Snippets are one of those seemingly simple features that can completely change how you design and inject using SparkPost. Snippets provide more flexibility and creativity when sending email campaigns, and they dramatically reduce wasted time and energy spent maintaining and updating numerous templates. Bottom line, Snippets let you build more awesome emails! As you experiment and leverage snippets, we’d love to hear about your experience, and in what unique ways you used them. In fact, your input and feedback will be an important part of how we continue to develop Snippets and other templating features. We’ve created a form that makes it easy to share your feedback with our product team — or Tweet us or give us a shout in our Community Slack! Snippets are coming soon! Pieces of reusable content that can be imported into any html or text email content using our render_snippet macro call. 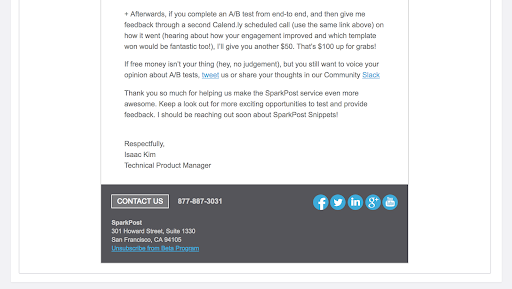 Learn how to get started with SparkPost’s new A/B Testing feature that's been optimized for transactional email and other app-generated notifications. Learn about three major upcoming changes to error handling in our Transmissions API that we're rolling out in January 2019.